We aim to provide easy to understand guides and example Health and Safety Related Method Statements. Writing a Method Statement is not difficult and we show you how easy they are. Our Navigation and method statement banners lead to websites in our professional network of health and safety documents and advice. 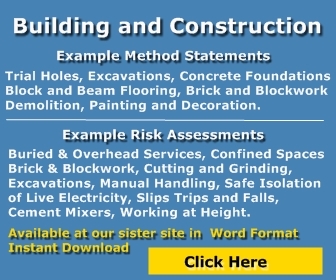 Method Statements and Risk Assessments Price Reduction. Method statements should be written so that all persons involved in the task can read and understand the content.